There are some books that are widely known as titles, but that few people actually read. Thomas de Quincey’s Confessions of an English Opium Eater seems to me to be one of them. The title still sounds so exotic and daring, perhaps promising all manner of sensationalism. But the book itself? It’s my contention that the book and the promise of its title are something of a mismatch. 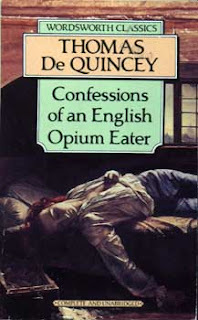 De Quincey (1785-1859) wrote Confessions of an English Opium Eater in his mid-30s, first as a series of magazine articles, then as a little book, which was published in 1821. It made his name and fame and was to be the one title of his that most people remembered. But there is a problem for modern readers. When he was in his early 70s, de Quincey took it into his head to revise Confessions of an English Opium Eater extensively for a collected edition of his works. In revising it he expanded it, re-wrote it and gave it more coherence as a narrative. But in the process he also made it considerably duller, plodding flat-footedly through what has originally been presented more allusively. It you intend to read it, you have to check first which edition you are reading, the original 1821 edition or the revised 1856 edition. They sit next to each other on my bookshelf. I prefer the original 1821 version. As its title says, Confessions of an English Opium Eater is an account of de Quincey’s own addiction, but (although he was a lifelong drug-taker) it refers mainly to the period when he was in his late teens in about 1804-05, loose in London on his own, running away from his studies, and willing to live in squalor so long as he could score the stuff. Reading it, it is genuinely odd to think that his squalid experience was going on in the same age as the Napoleonic Wars. It is doubly odd to think he was writing decades before British interests forced opium upon the Chinese Empire and created the whole culture of opium dens that we now associate with the drug. According to de Quincey himself, Manchester factory workers routinely took opium on Saturday nights to ease their brains after a week’s toil, perhaps a reminder to us of how shattering factory work was in the earlier stages of what we now call the Industrial Revolution. It was from them that he first gained the habit. His (1821) book divides into three parts – a narrative account of his drug-taking, then an essay on the pleasures of opium, then a (longer but, I think, more half-hearted) account of the pains of opium. De Quincey’s prose can go purty and pretentious (“pandiculation” is used for “stretching” and “sternutation” for “sneezing”, forsooth), but he can also produce brilliant passages, and there are two I copied into my notebook to show his skills. Happiness in a bottle. No wonder when Baudelaire adapted and re-wrote his own version of de Quincey’s book he called it Les Paradis Artificiels (“Artificial Heavens”). Heaven is in a chemical kick. “The inscription remains forever” and the image of the stars – a brilliant metaphor and a brilliant simile developed in the same paragraph, and an insight relevant far beyond the phenomenon of drug-taking. Yet, while luxuriating in some of de Quincey’s prose, I found that much of his book irritated me. There is, throughout it, a sense of waste, of self-justification, of intellect misused. The terms “dependence”, “addiction” and “withdrawal symptoms” nowhere appear (some of them had not yet been coined when de Quincey wrote), but they are what de Quincey is really talking about, even if he claims, unconvincingly, that his later ailments were purely coincidental and had nothing to do with his use of drugs. 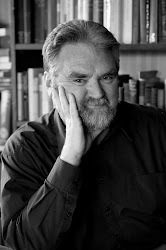 There are some vivid and engaging anecdotes – especially one concerning his running away from boarding school, with the porter who helped him making his trunk go bump-bump-bump down the stairs. But there is also much evasiveness about how he really lived in London, and how he scored his drugs. It seems that his later (botched) re-writing of the book was an attempt to answer people’s curiosity on these matters. Then there is the way my mind keeps constantly stripping away the veil of colourful prose. De Quincey speaks of sharing a derelict house with a 10-year-old waif, and of knowing Anne, a 16-year-old prostitute. I take away the embroidery of his language, and I see a tinny-house and bare floor-boards and young people’s lives being right royally screwed up, as in some unlovely piece of reality television. What sort of lives were that 10-year-old and that 16-year-old really living? Perhaps the teenager de Quincey never enquired, but I still feel disgusted with him that he is less concerned with them than he is with recounting his opium dreams. Dare I use the term “self-centred”? I suppose all good writers are, to some extent, self-centred, but many at least have a kind of social conscience. I'm afraid I have to disagree with your final characterization of de Quincey. It's been some years since I read Confessions, but I still remember and am deeply affected by the memory of de Quincey wandering the streets of London looking for Anna after she failed to meet him. You may have a point, Anonymous. I do have a soft spot for the ironist who took on Malthus in one essay and spoke of murder as a fine art in another - but there is still a huge degree of self-absorption in his outlook and especially in this druggie classic.